I am writing this from the Hotel Romantico in Sitges, northern Spain, twenty minutes south of Barcelona by train. Sitges in early October is a regular stop for Michel, my husband, and I. We drive here from our farm in the hills behind Cannes to participate in a Mediterranean documentary film festival and market, MEDIMED. Documentary filmmakers congregate here at this time of year to discuss, pitch and fund projects whose subjects are in one way or another linked to one or other of the countries that sit at the edge of this fascinating sea. Today, a rather choppy sea. It is a modest affair attracting a mere few thousand who work in this sector of the film and television business The festival runs for three days. What is extraordinary and never fails to fascinate me is that running in parallel to ours is another film festival – I have always marvelled at why the city holds both at the same time, but it does. The two festivals coincide and coexist. The other, The Festival Internacional de Cinema Fantàstic de Catalunya, opens this afternoon and runs for ten days. It is a far bigger and more bizarre affair, attracting horror and fantasy fans and moviemakers from all across the globe. As I write, they are kicking off their festivities with a huge gathering in the lobby of this hotel, all are celebrating the occasion with glasses of the local bubbly, cava. I have never performed in a horror film (unless one counts the Italian spoof of King Kong, known as Queen Kong in which I had a small role back in the 1970s) and I know nothing about the genre, but I have learned from observing their market here, that it garners flocks of passionate followers most of whom seem to be clad in black. 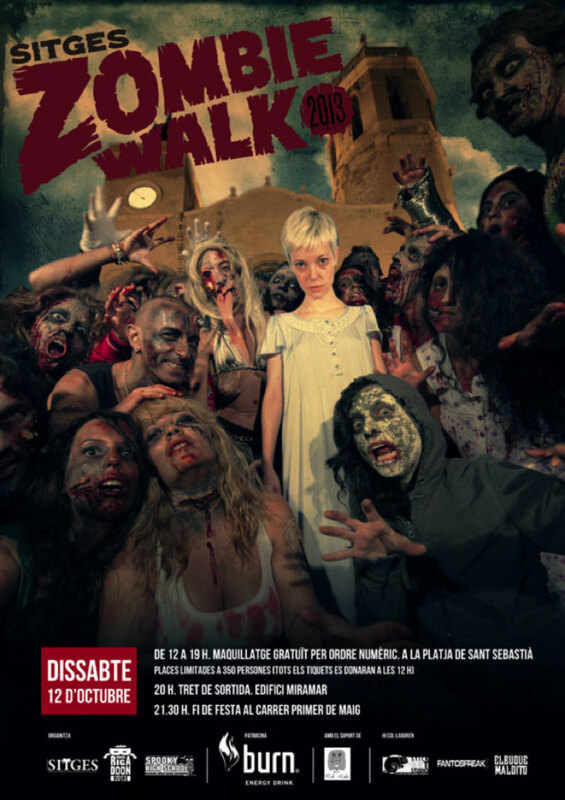 For me, the pièce de résistance of their festival programme is their Zombie Walk. This year it will be held tomorrow, Saturday evening. It begins eight-thirty in the Placa de l’Ajuntament and continues until long after Michel and I have retired to bed. Thousands of people, and I really mean thousands, parade the streets of this beautiful little seaside city of Sitges, dressed as crash victims, horror characters, zombies, ghouls, ghosts or any other number of beasties or baddies you can think of… We always watch on. Afterwards, there is a free party on the beach with music. Even in driving rains, they will party. My late father who owned a fancy dress emporium would have been in his element here. As with any highly regarded festival, awards are given. Vincent Price was an early Best Actor laureate for The Abominable Dr Phibes. Peter Cushing, Lana Turner, Geraldine Chaplin, Robert Downey Jr, amongst many others, have been triumphant here. However, our little documentary do will have well and truly packed up and left by the time the fantasy players are celebrating their prizes so I have never been fortunate to attend their ceremony. Still, it is great fun to be sharing the same town with them and it seems a whole lot less serious than the Cannes Film Festival. So, aside from this week of travelling, what else is going on in my professional life? My short story, The Girl in Room Fourteen, commissioned by Amazon has spent the past three weeks at number one on their Kindle Single charts. It sells at 99p or just over a dollar US. Thank you to all those who have already bought it and for those who have not yet, here are the links. By the way, you can download a free Kindle app for your phone or computer and read it on that. You don’t need to own a Kindle. If you live outside the US or UK, you can purchase it from your regular Amazon Kindle Store. I am at work on another for the same Kindle market. For those of you who enjoy all things French, I will be a guest speaker each day at the France Show in Earls Court from 17th to 19th January 2014.
you are welcome to join us for my annual Friends of the Olive Farm lunch which will be held on Saturday 18th January at a restaurant somewhere in the vicinity of the show. Go to the Facebook page to find out more. Bart Hulley, (webmaster extraordinaire) and I have been discussing small updates to this website. If there is anything you would like to see or read about, that you would enjoy more or less of, please write to me and let us know. After all, we have created this page for you so I want it to be a place you enjoy visiting regularly.